With Easter just around the corner, I received a phone call last week about a store that had put together the Two-Hour Tulip Purse Petite size with bunny rabbit ears to be used as an Easter Basket. I have not received a photo yet, but one is promised! However, when I ran into Liat of Miles of Stitches (Hemlock, MI), one of my best customers for this pattern, she told me she would send me a photo of the 42 Easter Baskets they made in 2009. Well, she did send me the photo, or Julie did, and also gave me permission to post it on my blog. Here is it! If this does not inspire you to try this easy pattern, nothing will! Are they not cute? I am very excited about the new quilt pattern which will be available at Spring Market (or maybe a little before!) I have made 3 of them so far, and have much interest from friends who are currently pattern testing. I won't post a photo yet and keep you in suspense! 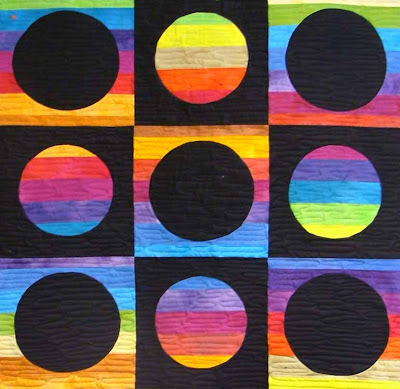 However, from a published pattern of mine, Circle in a Square, I was able to construct a wall hanging using the hand-dyed cotton fabrics by the lovely Lorin Fields, of Local Colour Hues. This pattern uses a set of 2-1/2 inch width strips of fabrics. Set in black, these colors just glow! I was able to get two quilts, each with 9 squares using the strips and the pattern. One is going to Lorin for her retail booth and one is going out in my trunk show, which leaves tomorrow. I have included a photo which was taken before binding. It now has a simple black binding that is not in the photo!